Ondine is pleased to announce the signing of a recording agreement with 22-year-old violist David Aaron Carpenter, who has recently emerged as one of the world's most promising young talents. The initial agreement calls for four CD releases. His debut recording - to be released in September 2009 (ODE 1153-2) - couples two concertos: a viola arrangement of Sir Edward Elgar's famous Cello Concerto and the Viola Concerto (1985) by Alfred Schnittke. Christoph Eschenbach leads the Philharmonia Orchestra. David Aaron Carpenter adapted much of the Elgar Concerto himself, using the well-known and Elgar-sanctioned arrangement by Lionel Tertis as a basis. Since making his orchestral debut in 2005 with The Philadelphia Orchestra under Christoph Eschenbach, David Aaron Carpenter has been performing with leading musicians and orchestras in the United States and Europe. In 2007, he became the first American and youngest protégé for The Rolex Mentor and Protégé Arts Initiative and the protégé of world-renowned violinist and violist Pinchas Zukerman. 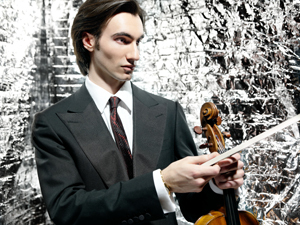 He was chosen among an international selection that included every violinist and violist of his generation. David Aaron Carpenter has been acclaimed as producing, "a seductively rich sound and demonstrating both a forceful interpretive personality and remarkable control of his instrument," (The New York Times) and, "whose beautiful modulated tone makes a striking impression." (The Strad) Conductor Christoph Eschenbach said, "It has been many years since I heard such a phenomenal talent as David Aaron Carpenter. He combines an endless imagination with a staggering technique, and making music together with him is a true joy." Industry veteran Kevin Kleinmann, who brought David Aaron Carpenter to Ondine's attention and serves as Executive Producer for this and future recordings with the artist on Ondine, said, "In my more than thirty years working with classical musicians, I have rarely encountered a more striking talent than David Aaron Carpenter. He combines an incandescent and imaginative musical personality with effortless technique and maturity far beyond his years. His intense musicality and talent brings to my mind such past greats as Michael Rabin and Jacqueline du Pré. Working on the Elgar recording project made me realize how, in David's hands, this Concerto works so well on the viola." Reijo Kiilunen, Managing Director of Ondine, added, "It is my pleasure to welcome this outstandingly gifted young musician to Ondine and to release his debut recording. I believe that David Aaron Carpenter combines superstar potential with an artistic depth uncommon for his age. The juxtaposition of the concertos by Elgar and Schnittke underlines our label's artistic vision, and we look forward to many further exciting recordings with David in the future." On signing with Ondine, David Aaron Carpenter said, "I want to express my gratitude to the Rolex Mentor and Protégé Arts Initiative for making this recording possible. I look forward to my collaboration with Ondine, a company that remains true to its core musical principals. I am fortunate that Ondine aligns its vision with my own to establish the viola as a solo instrument. Making my first recording with Maestro Eschenbach and the Philharmonia Orchestra has been a truly remarkable journey. Performing the Elgar Cello Concerto on viola has definitely been the highlight of my musical career thus far, and I hope that listeners will appreciate this masterpiece interpreted in a new light." Subsequent to the release of his debut album, David Aaron Carpenter will be performing the Schnittke Concerto in Dresden with the Dresden Staatskapelle conducted by Christoph Eschenbach on November 29th and 30th, 2009. Click here for more information about David Aaron Carpenter, including his biography and links to video and further press material on the website of The Rolex Mentor & Protégé Arts Initiative.